Thousands of schools have been backed by London 2012 Olympic gold medallist Katherine Grainger to go for gold themselves during this year’s Switch Off Fortnight. Switch Off Fortnight has been organised by EDF Energy’s national education programme the Pod to encourage schools to reduce their energy consumption and inspire families and friends to adopt the same good energy habits. So far, nearly 4000 schools have signed up for the campaign, which runs from Monday November 19 to Sunday December 2. 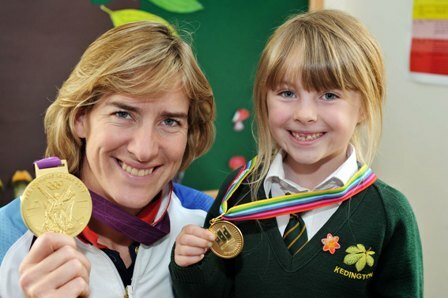 Katherine Grainger, who won gold in the coxless double sculls at London 2012, launched the campaign at Kedington Primary School in Suffolk. She said: “I’m hoping the hundreds of thousands of children at all the schools taking part in Switch Off Fortnight put in gold medal performances. In rowing, conserving energy for the long haul is absolutely vital – and the same is true for how we use energy every day. The Pod is encouraging schools across the UK to take part in the campaign and to raise awareness of why it is important to save energy. This year’s activity will focus on the ‘take it home’ message, encouraging pupils to take learnings around energy saving into their homes, to inspire families and friends to adopt the same good energy habits. The students will be set the task of auditing the energy wastage in their households, from appliances on standby to lights left on and talking with their family members about why it is important to save energy – not only will it help reduce carbon emissions but help save money on energy bills. Actress Jane Horrocks, who is providing the voice of Poogle for a new energy saving film for Switch Off Fortnight said “I’m passionate about how we should all do our bit to cut down on how much energy we use – and so is Poogle! Switch Off Fortnight is all about children taking the lead and getting us adults to think twice about our habits. This year the Pod, WasteBuster and Eco-Schools are all working together to help Britain’s school children to learn about energy efficiency and to then ‘Take It Home’ – going undercover to reveal what energy gets wasted in their homes, to then to talk to their families and persuade them to save energy. As part of the campaign, schools are sent free Switch off Fortnight campaign packs which include a tracking chart to add a competitive element and to encourage schools to continue to switch off all year round, fun posters, stickers and badges. Also available at www.jointhepod.org, are ‘take it home’ work sheets designed to help children engage their families and make the same changes within the home environment. Activities include ‘take it home’ secret mission work sheets and ideas around encouraging family members to reduce their energy consumption. More than 16,000 schools are part of the Pod and through it EDF Energy has engaged with more than seven million youngsters on sustainability issues. To sign up to Switch off Fortnight and for more information on EDF Energy’s The Pod, visit jointhepod.org and click on news.